Mirror’s Edge is a game that goes to some lengths to make the player uncomfortable. This makes sense: The world is not right. Corporations rule, the police are corrupt, people you think you can trust, turn out to be your enemies. The weird sisters don’t throw tea parties. 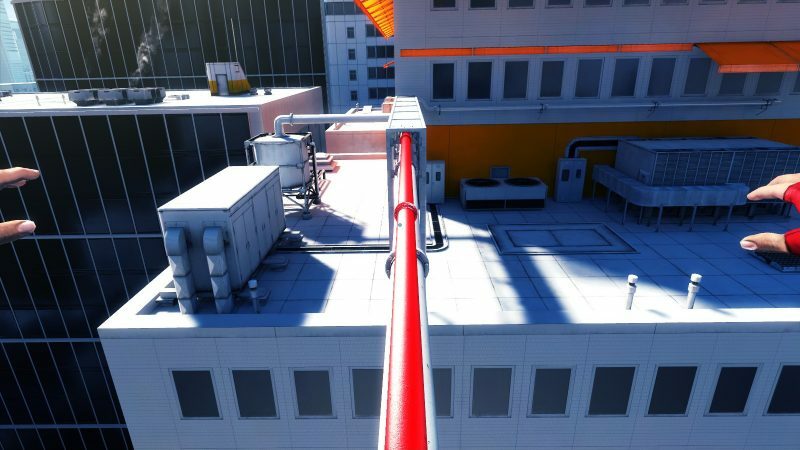 Why should Mirror’s Edge make you feel warm and tingly? But again: How do you distinguish between uncomfort-inducing and just plain annoying game design? Let me give you another example: Guardian Angel guy. He Is Absurdly Unhelpful. You arrive a three-way junction and he suggests you take ‘the next alley’. The whole level is up-up-up and he informatively tells you that you need to get to a higher level. “There has to a be a way out”, “You need to move through [unidentifable section] to get to [other unidentifiable section]”. He Yammers on About the Plot. Especially when I’m desperately trying to concentrate on a difficult bit. Dude, I’m trying to think. He Plain Out Lies. He will tell you that more ‘blues’ are on the way when you can perfectly safely go make yourself a cup of coffe and leave Faith to do her nails, her ‘screensaver’ mode. It’s no big mystery: The developers are aware that some puzzle scenes are a bit laid back and lacking in tension. So in order to artificially inject tension into the scene, they have Ear Pierce shout at you about non-impending non-danger. He Does Motivational Quips. “Gotta get out of there”, “You need to move, Faith”, “Get a move on.” You. Are. Not. Helping. They sort of blend into the previous category of outright lies, beacuse they serve the same purpose: A false sense of urgency. You can argue that the proof of the pudding is in the eating. Is he putting you on Edge™? Then he serves his purpose. I would argue that just like the thud issue he is taking me out of the game by making me mad at the developer who made these choices. Suppose for a second that Papers Please introduced a paper cut mechanic (@dukope DLC? #letsdolunch). If you’re too careless in your paper shuffling you cut yourself and start dripping blood all over the interface, making it harder to spot the incongruities. Would this enhance the arendtian theme of evil laced with banality? Or just be a bloody nuissance (@dukope #puntotallyintended #seriousaboutthatlunch)? I think the answer is found by looking at the things in Mirror’s Edge that, at least to my mind, do work the way the developers intend them to without the drawbacks. Instead of dropping in a video here I’ll ask you to recall the game’s sound of police helicopters hovering over you. You can’t see it, you can just hear the vicious steel flip-flip-flip somewhere above you. It somehow looms, even though nothing can possibly loom while being engaged in a high-speed chopper chase. That is one of the most effective ways to induce a sense of dread and feelings of vulnerability and exposure I have ever seen. That works and it makes me furious at the guys in the chopper, not the foley artist. Or take the way the game makes every direction indistinguishable from every other due to the color palette and the way it delights in doing the video game equivalent of tying you to an office chair and spinning you around ten times. There is no real way to tell what direction you came from and where you should be headed at any given time. The only way forward is spotting a bit of red or just plain guessing. While it can be frustrating at times I would argue that mainly it works. The blinding whiteness, the lack of a sense of direction, the confusion: It all ties into a theme of being lost in an authoritarian surveillance state. All you can do is run and hope you’re doing in the right direction. I am not sure I can distill the answer down to a rule of thumb but if you’re a game director I think it’s a good start to ask yourself: Does my game make players angry at the villain… or me?